Warning: Long Review We are a group of 4 sisters (56 - 62) and since the port was two hours away and the cruise only 4 nights it was perfect. Embarkation was easy and quick after waiting in line to drop off luggage and then self park. Three of us were fully checked in and they just scanned our passport. My one sister had to do the birth certificate route and have her picture taken but it really didn&apos;t slow us down. Security moved along fairly well and we were on board before 12. Room keys were outside the stateroom when we got there. Rooms were ready at 1:00 pm as we were told. The ship itself was the biggest we had ever been on, and did take us a bit to find our way around-mostly getting turned around in the Promenade area. There are interactive deck plans but not necessarily right at the elevators and I had trouble finding what I needed. They had a program introducing you to the Anthem but it was when the ship was pulling out (late start-like 45 min.) Muster drill: we were there for almost an hour. They said they were waiting for people to board? And it was pretty worthless, but at least it was inside and we had seats. 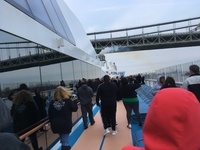 Even though it was cold, it was worth heading outside after the drill to see the NYC skyline and the ship going under the Verrazzano Bridge Cabin: We had a guarantee balcony, which ended up in a really good location (forward port side and not far from the steps). We needed the walk to the eating areas to make up for all the great food we had. And it was straight up to the Solarium/Inside Pool, and straight down to the theater. The room was a nice size although with the sofa bed pulled our it was quite crowded. The room steward left it out, but I suppose we could have requested he put it away each day. I was the only one who slept well on the sofa bed. We took turns each night. There was enough room for us all to store our things, but a longer cruise-I don&apos;t know. Would have had to do separate cabins. Entertainment/Royal IQ App: We had prebooked the shows, but I immediately logged onto the Royal IQ app and made reservations for two of us for iFly and all four of us for North Star. The app was easy enough to use, but certainly could have had more features. No hours for eating area, pools, etc. So you can&apos;t really do without the paper Compass. We each had a separate credit card, and while it showed the individual charges there was only one total. It is only wifi enabled for the app, but my iPhone kept trying to access wifi for all my wifi enabled apps which I think drained my battery faster. (Phone set to airplane mode and wifi on). We prepaid for one device internet package, which we thought we would share, as you can log off one device and use another. However, with iPhones, we were able to text message without using the internet package. Dining: We had early seating and ate in the Grand three out of four nights. We all thought the food was mostly good, occasionally great. Service was great. But no restroom outside 3rd floor dining rooms. Have to go into Casino or up to 4th floor. Windjammer for breakfast--we found the way back less crowded and kept us from returning frequently to the buffet. There is limited outside seating there but it was too cold.There is a not crowded made to order omelet and crepe station for breakfast, gluten free for lunch. Breakfast in the main dining room on disembarkation day was good and fast service. We also ate lunch one day in Cafe 270 and one day in the Solarium. A nice change from the Windjammer. Service was friendly and mostly good. Sometimes they would be around with drinks, cinnamon rolls, etc, and sometimes you wouldn&apos;t see anyone. The three shows were mixed for us. Spectra&apos;s Caberet the technology and different choreography were great, but the music was repetitious. We Will Rock You was a great production, but we had trouble with the story.. You have to read the screen in the beginning and we were just settling into our seats. The Gift also had great singers and production but we had trouble telling who was who. The theater may be beautiful, but most of the aisles have exits on only one side--and you don&apos;t know that until you climb past people and find a plastic wall or other blockage. I have a little claustrophobia and had to leave before The Gift started, and luckily found a seat in the back. Despite being a short cruise, the theater was never full. Maybe because many of the seats are blocked by poles. And maybe because you can&apos;t get to many of the seats without climbing over a whole long row of people. We loved the North Star, iFly and the Bumper Cars. North Star and iFly were filled so it is best to book as soon as you get on board if you were not able to prebook. Very easy on the app.Two of my sisters did the dance/exercise classes and I was really surprised how few people were there. We were told there were 4300 people on board (can hold up to 4900) but it rarely felt crowded. Ports/Excursions: We were in port (Bermuda) from 9-3:30 so three of us elected to tour the Dockyard, while my birding sister had hired a guide. However, we should have gone with her--she got to see the whole island and did little birding but heard lots of history and ecology stuff. (although she was a little late getting back and got yelled at-but she said there had to be a 100 people behind her) Most of the places were not open when we got off the ship (Did open later) and wasn&apos;t clear when they would open. And the beach was closed for the season--this was a problem probably only for this cruise as it was December. But cruise staff should have known. There is a courtesy shuttle which takes you around the dockyard so if you have trouble walking--it helped me out. Disembarkation: We had a 7:30 time, and decided to try the dining room. We were finished right around 7:30 and by the time we went to the bathroom and started for our waiting area our number was called. The line was really long but moved fast. However, our luggage was at the opposite end of the terminal building, we had just waited in one long line, and there was a long customs line we were expected to walk all the way back to. Luckily there are porters there who will take your baggage and expedite your way through customs. Well worth the $20 tip we gave him. So in that respect disembarkation went as well as could be expected with that many people. I would like to go back to Bermuda and I guess I would like to take my husband to experience the Anthem, but for me, once was enough for all the activities that we did do. Cabin: We had a guarantee balcony, which ended up in a really good location (forward port side and not far from the steps). We needed the walk to the eating areas to make up for all the great food we had. And it was straight up to the Solarium/Inside Pool, and straight down to the theater. The room was a nice size although with the sofa bed pulled our it was quite crowded. The room steward left it out, but I suppose we could have requested he put it away each day. I was the only one who slept well on the sofa bed. We took turns each night. There was enough room for us all to store our things, but a longer cruise-I don&apos;t know. Would have had to do separate cabins. Entertainment/Royal IQ App: We had prebooked the shows, but I immediately logged onto the Royal IQ app and made reservations for two of us for iFly and all four of us for North Star. The app was easy enough to use, but certainly could have had more features. No hours for eating area, pools, etc. So you can&apos;t really do without the paper Compass. We each had a separate credit card, and while it showed the individual charges there was only one total. It is only wifi enabled for the app, but my iPhone kept trying to access wifi for all my wifi enabled apps which I think drained my battery faster. (Phone set to airplane mode and wifi on). We prepaid for one device internet package, which we thought we would share, as you can log off one device and use another. However, with iPhones, we were able to text message without using the internet package. Dining: We had early seating and ate in the Grand three out of four nights. We all thought the food was mostly good, occasionally great. Service was great. But no restroom outside 3rd floor dining rooms. Have to go into Casino or up to 4th floor. Windjammer for breakfast--we found the way back less crowded and kept us from returning frequently to the buffet. There is limited outside seating there but it was too cold.There is a not crowded made to order omelet and crepe station for breakfast, gluten free for lunch. Breakfast in the main dining room on disembarkation day was good and fast service. We also ate lunch one day in Cafe 270 and one day in the Solarium. A nice change from the Windjammer. Service was friendly and mostly good. Sometimes they would be around with drinks, cinnamon rolls, etc, and sometimes you wouldn&apos;t see anyone. The three shows were mixed for us. Spectra&apos;s Caberet the technology and different choreography were great, but the music was repetitious. We Will Rock You was a great production, but we had trouble with the story.. You have to read the screen in the beginning and we were just settling into our seats. The Gift also had great singers and production but we had trouble telling who was who. The theater may be beautiful, but most of the aisles have exits on only one side--and you don&apos;t know that until you climb past people and find a plastic wall or other blockage. I have a little claustrophobia and had to leave before The Gift started, and luckily found a seat in the back. Despite being a short cruise, the theater was never full. Maybe because many of the seats are blocked by poles. And maybe because you can&apos;t get to many of the seats without climbing over a whole long row of people. We loved the North Star, iFly and the Bumper Cars. North Star and iFly were filled so it is best to book as soon as you get on board if you were not able to prebook. Very easy on the app.Two of my sisters did the dance/exercise classes and I was really surprised how few people were there. We were told there were 4300 people on board (can hold up to 4900) but it rarely felt crowded. Ports/Excursions: We were in port (Bermuda) from 9-3:30 so three of us elected to tour the Dockyard, while my birding sister had hired a guide. However, we should have gone with her--she got to see the whole island and did little birding but heard lots of history and ecology stuff. (although she was a little late getting back and got yelled at-but she said there had to be a 100 people behind her) Most of the places were not open when we got off the ship (Did open later) and wasn&apos;t clear when they would open. And the beach was closed for the season--this was a problem probably only for this cruise as it was December. But cruise staff should have known. There is a courtesy shuttle which takes you around the dockyard so if you have trouble walking--it helped me out. Disembarkation: We had a 7:30 time, and decided to try the dining room. We were finished right around 7:30 and by the time we went to the bathroom and started for our waiting area our number was called. The line was really long but moved fast. However, our luggage was at the opposite end of the terminal building, we had just waited in one long line, and there was a long customs line we were expected to walk all the way back to. Luckily there are porters there who will take your baggage and expedite your way through customs. Well worth the $20 tip we gave him. So in that respect disembarkation went as well as could be expected with that many people. I would like to go back to Bermuda and I guess I would like to take my husband to experience the Anthem, but for me, once was enough for all the activities that we did do. Not sure of category as we booked a guarantee. 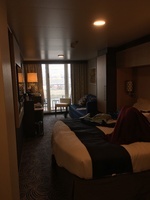 It was different from all other cruises I have been on as it was not bathroom on one side closets on the other when you enter. The bathroom was on the right as you enter in the corner. Good enough size, but clear shower door meant for us only one person in there at a time. There was a closet then the large bed also on the right, then another cabinet, then the sofa bed. On the left opposite the sofa bed was the desk/drawers/refrigerator. The balcony was ok for the view, but as it was cold we were not out there too much. We did have a view of the NYC skyline and Statue of Liberty, and we were awake coming into port and could see the lighted Verrazzno Bridge. Since we were here off season and for a short time, my rating isn&apos;t really fair. We opted to only tour the dockyard, but there is easy transportation available when you get off the ship. Taxis to Horseshoe Beach and others were easily available. The free courtesy shuttle was nice, as the pier was a hike to begin with, and we walked to the glass and rum stores, and they were closed, and then the beach was closed and we were frustrated. There was a museum open ($15) which we may have done, but we were meeting my other sister for lunch and didn&apos;t have enough time. Luckily the shuttle came along and we got to see the main points of the area, and then after meeting up with my sister we took it again to go to several places--the glass and rum store were then open, a pharmacy with souvenirs and snacks and a nice shopping mall.